We invite you to explore India - the Land with infinite beauty ! Whether you soar high into Himalayas or peer under the ruins of the Ancient monuments dotting the landscape of India, you will cherish the experience long after your visit ! This India Travel Guide on Temples in Mathura and Vrindavan is free from any commercial interest! This site is dedicated to promote India - the vast subcontinent, its glorious past, magnificent landscape and its infinite variety. Mathura is the birthplace of lord Krishna and is located on the bank of river Yamuna in Uttar Pradesh. Mathura is well connected by rail and road. The nearest airport is Agra. Every temple in Mathura is associated with the life of Krishna. A trip to Mathura can easily be combined with a visit to Brindavan as it is located just 15 km from Mathura. Mathura and Vrindavan hold significance for devotees of Lord Krishna as these are the places that he spent his early childhood. Dwarkadhish Temple: Built in 18th century, it is the main temple in the town. Festivals like Holi, Janmashthami and Diwali are celebrated with grandeur. The architecture, paintings and carvings are interesting as it draws elements from the nearby regions. The festivals of Holi, Diwali and Janmashtami are celebrated with much fervor here. Gita Mandir: Little away from the central town, this temple has marvelous carvings and paintings attracting huge number of visitors. Shri Krishna Janma Bhoomi: You can find a stone slab that marks the birth shrine of Lord Krishna. There is also a small temple. Vishram ghat: A sacred place where Lord Krishna is believed to have rested after slaying Kamsa. There are nearly 25 ghats in Mathura and this is the most prominent among them. Katra Kesha Dev Temple: The present day temple is built over the ruins of the Keshav Deo Temple that was destroyed by Aurangzeb. It is said to be built on the prison cell where Lord Krishna was born. Gita Mandir: Located on the Mathura - Vrindavan road, don't miss this temple that has walls inscribed with the entire verses of the Bhagvad Gita. Rangaji Temple: This temple boasts of a traditional South Indian-style Gopuram and high walls. The main deity is Lord Ranganath, a form of Lord Krishna. Here he is showing reclining on the Sesh Naag. The annual Rath Mela and Jal Vihar are main festivals celebrated here. The Rath Yatra or Brahmotsava lasts for 10 days in the month of Chaitra. 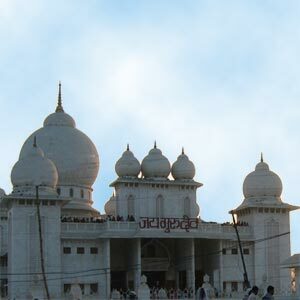 The Iskon Temple is built in marble and devoted to Krishna, Balaram and Radha. Also located here is the Samadhi of Shri Prabhupada, the founder of the ISKCON sect. Jugal Kishore Temple: This is perhaps one of Vrindavan's oldest temples - completed in 1627. This temple is also referred to as Kesi Ghata Temple. Bankey Bihari Temple: This temple is home to the black stone statue of Lord Krishna that was discovered by his devotee Swami Haridas in Nidhuvana. This temple in Vrindavan is very popular with Krishna followers. Radha Madana Mohana Temple: This was the first temple built in Vrindavan. Radha Vallabh Temple: This temple is of special significance to those devoted to Radha. But you will not find any deity of her here. She is represented by a crown placed near the statue of Krishna.